1. The arrangement of military troops, ships, planes, etc. in a steplike formation: The head of the defense department arranged an echelon to meet the potential threats of attacks by enemy forces. 2. A level of authority or responsibility which is designated as a higher or a lower level: There have been stories about the corruptions in the upper echelons of the company. 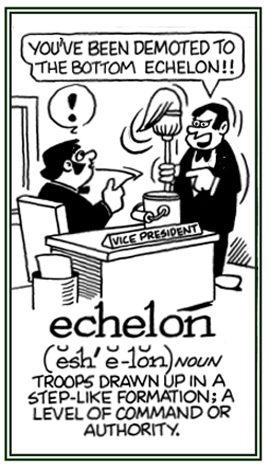 One kind of echelon consists of a unit of an army; such as, a company, a battalion, a division, or a corps. The action of mounting a fortification by the use of a ladder: The king warned his son that the escalade he was planning to use in order to rescue the princess in the castle by climbing up the wall would be extremely dangerous! To scale or to move upwards and over: The hikers made attempts to escalade the cliff in order to reach the peak of the mountain. 1. To increase, to enlarge, or to intensify: The President was trying to escalate the number of troops in the war zone. Company losses have been escalating so it is imperative that the owner finds better top-level administrators to solve the financial problems before they escalate into a disaster. 2. To make greater and more intense: The political opposition has had a long-term disagreement with the current head of state which is escalating into a potential break up of the administration. 3. To develop into a more serious situation: The news on TV indicated that the demonstrators were escalating their opposition to certain government officials. 4. Etymology: from Latin scalare, "to climb". 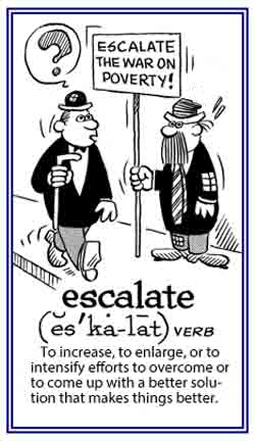 Originally escalate referred "to traveling on an escalator" and from this meaning of "rising", it now means any "increasing" of something. That which is increased in extent, intensity, or magnitude: An escalation of prices was caused by the worker's demand for higher wages. Inflation and other factors caused an escalation in building costs. In the context of a trade war, escalation refers to an increase in tariffs that occurs when countries retaliate against each other again and again. 1. A set of moving steps attached to a continuously circulating belt, that carries people up or down between levels in a building:: Edda and her two children went by escalator, instead of taking the elevator, to get from the first floor to the third one in the department store. 2. A stipulation in a contract that allows for a decrease or increase in salary, benefits, or prices, which is determined by specific conditions: Because the cost of living had gone up, James was very happy that the written settlement with his firm included an escalator to give him a pay raise! 3. Etymology: from 1900, American English, a trade name of an Otis Elevator Co. "moving staircase", coined from escalade, a borrowing from about 1600 from Middle French, where it meant "an assault with ladders on a fortification"; from Latin scala, "ladder" + -ator, "person or thing acting in a certain way"; as in elevator. 1. In music: a sequence of notes in an established order beginning with one note followed by the next one which is higher than the previous one, usually reaching 8 notes in all: Before beginning to play her pieces, Grace had to practice her scales in C-major. 2. That which shows the ratio between the size of something on a plan or model and its size in the real world: The scale on the map is 1:1,000 and shows all the little roads in the area. 3. A listing of the salary or fees which someone gets paid: Greg was interested in what the government paid its teachers, so he checked the pay scale to see where he fit in with his monthly wages in comparison with the other teachers at his school. 4. A set of standards or positions which are used for measuring, rating, or comparing things: The therapist asked Susan to make checks on a scale of zero to ten, showing how satisfied she was with the progress of her therapy sessions. 5. Very small hard parts of the outer layer of a fish or reptile: The scales on the trout Becky saw in the stream glistened beautifully in the sunlight. 6: The device used for weighing people, food, animals, etc. : When Tom got on the scales in the bathroom, he was surprised that he had gained a few pounds! 1. To flake off or to chip off: The paint on the living room walls was scaling off so much that the room had to be repainted! 2. To scrap off the tartar from the teeth: It’s important for a dentist to scale a patient's teeth regularly in order for them to stay as healthy as possible. 3. To remove the small hard parts from an animal’s natural covering: To prepare the fish fillets for dinner, they have to be scaled and skinned perfectly and the inner organs must also be removed. 1. The act of reading or observing something closely: A quick scan of Debbie’s bedroom showed that she hadn’t picked up her clothes from the day before. 2. A medical examination by using an electronic device which generates an image for a computer: At the medical center, Timothy had an ultrasound scan performed on his kidneys which revealed several cysts. 3. The image which is acquired by using an electronic instrument for medical purposes: The digital scan was scrutinized by the doctor to make sure that the tumor had been removed completely during the operation. 1. To look at something meticulously in order to detect some particular feature: While they were in the forest, Jim used his binoculars and scanned the trees in order to detect any interesting birds. 2. To inspect reading material in order to single out important information: Susan scanned the directions about her new washing machine in order to see how to use it correctly. 3. To transform an image into a digital form: Betty wanted to scan the article about trees so she could send it via e-mail to her sister. 4. To effectuate an object, a surface, or a part of the body to be examined by an electromagnetic beam: Airports have metal detectors which scan luggage to make sure there are no illegal weapons hidden in them. 1. An event or action seen to be legally or morally incorrect and which produces widespread public anger and resentment: Kevin enjoyed reading through the newspaper in the morning looking for political scandals; especially, those involving finances and bribery. 2. Anger or indignation brought about by shocking or outrageous events or actions: The scandal brought on by the couple’s divorce caused a lot of sensational talk and rumors among the people in the little village. 3. Gossip or hearsay regarding slanderous or defamatory behavior or incidents: The first thing the group of young ladies at the café talked about was the scandal involving the young waitress at the restaurant who smoked a pipe and wore very short and tight pants! 4. A situation or case which is thought to be wrong or deplorable and sets off general public outrage or agitation: It seems to be quite a scandal among those concerned that hospitals have so few nurses to tend to the needs of the patients. A periodical in which the content pertains mainly to gossip, small talk, or hearsay: The scandal sheet appeared once a week and dealt mainly with the financial problems of movie stars, their intimate relationships outside their marriages, and their illnesses. Showing page 2 out of 4 pages of 48 main-word entries or main-word-entry groups.